It's all Colby Rasmus' fault...whatever the fault is. But really, lay off the kid, it's only the third game of the season. What if it was a double? Hafner’s up, the defense is in the shift, drastically, and Cronk lines one down the 3rd base line. Cripes! This is going to be bad. Cleveland had men on, it was a 2-2 game at the time, and Saturday afternoon looked like it just got dreary. But then Toronto got a call. The ump said foul, Hafner would have to do it again, and he couldn’t. The score remained 2-2, and Toronto would go on to win 7-4 in 73 innings (Sorry, just felt like that…). That call could have gone either way. It wasn’t bad, it was borderline. The weekend could have been 1-2 for the Jays, it could have been 3-0 if Bautista wasn’t so frustrated on how low Perez’s fastball was. I don’t blame the ump. I watched the game, he was consistent with that call for both sides, but it was a low zone, and hitting can be like golf. Something gets in your head, you get frustrated, and you shank it. What I am fascinated by after the weekend though is how many people seemed to have gotten absolutely no sleep after all the excitement. It’s the only explanation I can think of for the ubiquitous lunacy on the post game call in shows. Hands up how many people actually know Colby Rasmus? Can Richard from Pickering stop calling in and commenting on his character? We are three games in to a 162 game marathon, and already, Toronto faithful is rearing its head. I’ve explained this to my Leaf nation buddies. I’m sympathetic, because I think you’re all poisoned. Have you ever watched someone stuck in a sad moment of denial. The girl who puts on the outfit that is just too small for her, because that’s the outfit every other girl is wearing. And then the poor thing ends up pulling on the edges all day. Readjusting her shorts, pulling her top down, because even though she looks fine, she isn’t comfortable in her own skin. It’s been so bad for so long in Leaf Nation, that you can’t call it what it is anymore. It’s too embarrassing. You can’t look in the mirror. So, you crap on yourself, you crap on others, you’re generally a defeatist about the whole situation anyway (imagine our perfectly pretty girl just standing in front of the mirror grumbling, “I’m fat” while you shake your head) and nothing is ever going to go right. You’re so convinced the sky is going to fall you’ve become a fan base that must find that reason even during the good times. Hey, I don’t blame you. Even I put the Leafs in the playoffs this year. First to worst in a couple months, unreal. But it’s baseball. You have two World Series, and the way it’s spoken about, a 20-year playoff drought has you as the worst organization in the entire league. Has anyone seen the Cubs, Pirates, Royals, Nationals or Astros, play ball lately? What are the winning traditions in San Diego, Milwaukee or Cleveland? Kelly Johnson does not represent a massive upgrade in defense at second base. As I recall, it was hitting that haunted Hill. There are maybe 20 people, and not all in this city, who know what Colby is thinking. Richard, you’re not one of them! The Jays have not shown they can’t hit starters. They’ve faced three. 159 to go. Settle down people, and watch baseball. This organization doesn’t spend enough money…. (Scott Rolen, north of $10 million a season, Vernon Wells, extended until he’s 83, Roy Halladay, constantly near the top of starter’s salaries, Roger Clemens, what was it a bajillion per game and he didn’t have to practice? AJ Burnett, ok, it was $55 million too much, but I was excited that offseason…BJ Ryan, Alex Rios, how many extensions and bloated contracts do you need? Let’s evaluate after six weeks or so, okay? And for right now, understand that inches could have meant two completely different weekends and the weekend, doesn’t represent anything, yet. It will be a small part of a collective whole. What 162 games takes is consistency, health, determination, not knee jerk reactions. Not making decisions on young talent after a cup of coffee with them. We have two of the finest modern day example of players who looked like they wouldn’t reach their ceilings in their firsts year in the league and then, in time, found it (See: Roy Halladay and Jose Bautista) and still, this town is ready to Larry Murphy guys after a handful of games. I attribute it to Leaf poison. It’s all I’ve got. ‘Cause man, these kids are loaded with top end talent, and I want to see what every single one of them can do. Kelly Johnson will go 0 for 4 tonight, and the callers will wonder why Hechavarria isn’t playing second yet. Someone will suggest bringing him up, playing Johnson in centre, and sending down Colby Rasmus…. At my 312th (little exaggerated) Blue Jay game, I finally have a seat in a popular foul ball zone and am convinced I will catch that elusive foul ball. Thirty line drives will be hit my way…but I’ll continue to miss every single one….by inches…. Thanks to the terrible aim, of Colby Rasmus…. David Ortiz will knit a scarf during the two and a half minutes he takes between swings, proving to everyone that doesn’t believe he can field a position, that he can at least multi-task. But the colours won’t match his uniform. 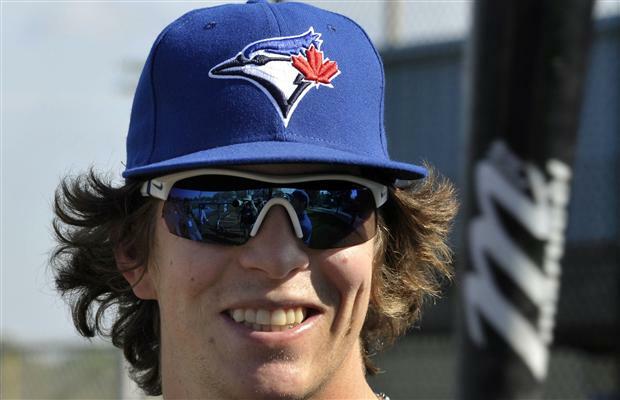 Someone will blame Colby Rasmus…. After their fourth straight loss to begin the season, Bobby Valentine will hold a press conference for 23 minutes. 21 of which will be about Bobby Valentine. During the other two, he’ll blame the loss on Colby Rasmus….